The Bull Market remains in place fairly secure, but it may be heading for a near-term partial eclipse, to use the word of the month. A stock market pull back of around 5% to 10% in major indexes from their highs can occur, but the rising market drumbeat of a sharp bear market continues to appear misplaced for now. It is fairly obvious that a market that rises for many months without a pull back is closer to encountering one with every passing month. Even though it is hard to predict when a pull back will occur, it does appear that the potential risk is rising due to a confluence of a number of near-term factors. "The biggest risk for 2017 will be the policy framework of the Trump administration. If the administration is unable to deliver by getting bogged down with controversies or policy differences between the new White House and the Republican-controlled Congress, this will lead to a resetting of expectations downwards...At this time, we believe the first-half will be better for stocks, then the second half, primarily because of fear of unrealized expectations." Eight months later, the administration does appear to be not making much progress in achieving its growth agenda. This does create a broader stock market risk at this stage which can limit further gains and either create a sideways, range-bound market till policy holdups are resolved or pull back. A key gauge of progress will be the timing of a tax reform or tax cut bill, and any signs of meaningful progress, once the Congress returns to session in September, will be highly favorable for the stock market. There are some events that coincide in September and October and create potential event risks for the stock market. The US Government debt-ceiling is expected to be raised eventually by end of September or early October. Any delay or drama around this event which can lead to a government shutdown will be near-term negative. Besides obvious risks to financial markets and economy from the US Government's inability to pay, the amount of focus and time a delay can consume will only end up further pushing-out the growth-oriented policies. A quick resolution in September will limit risk and be viewed favorably by the stock market. The Federal Reserve is expected to authorize a balance sheet roll back or a quantitative easing reversal by October and is expected to announce a start date at its meeting on September 19 and 20. By itself, the quantum and pace of the rollback of a few billion every quarter on a $3.6 trillion stimulus related balance sheet expansion should not be a major stock market issue. It can be considered to have more symbolic relevance as the runoff of the balance sheet assets finally begins the predictable winding down of the huge monetary stimulus to counter The Great Recession. But there is an attendant risk of how the runoff may be perceived and impact the broader financial market and the risk embedded within the financial system, after nearly 10-years of stimulus. The ripple effect is not well-understood yet due to the uniqueness of the situation. That is why we had argued in our earlier writings, Will The Federal Reserve Avoid A Slowdown, and its follow-up, A Monetary Policy Reset, that the Federal Reserve should consider deferring its final rate increase for the year since the de-easing can be viewed as an additional rate hike. In addition, such a deferral would also allow the Federal Reserve to obtain sufficient evidence of no adverse unanticipated effects from its balance sheet run-down. We had taken a similarly cautious viewpoint leading up to the Federal Reserve's first interest rate increase, from the zero-level, back in December 2015. This is an important high-risk event and investors should plan for elevated bond and stock market volatility around the time when quantitative de-easing begins and the month thereafter. The small cap stocks have underperformed the stock market this year and recently slipped below a key technical level of 200 days moving average. The index at the beginning of August was up +5% and since then has slipped into slightly negative territory. Small caps are generally indicative of the speculative risk appetite, and their retreat so far does suggest narrowing market breadth. Incidentally, the indexes have pulled back from their recent highs with the Russell 2000 (IWM) correcting -7%, the Nasdaq (QQQ) -5%, and the S&P 500 (SPY) just under -3%, before moving up from the lows. Conditions do exist for elevated risk over the next two months. Will that result in a pull-back, higher volatility, and a period of consolidation? 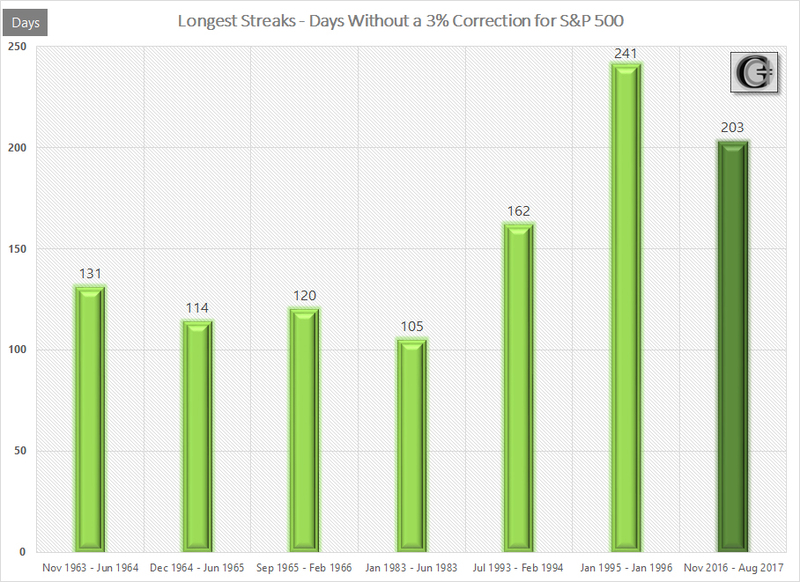 The S&P 500 presently has not had a 3% pullback for over 200 days. This is the second longest streak. By itself, that is no reason for a pullback, for no one knows if the present streak can become the longest one, and 3% is an arbitrary pull back threshold. But at times an extended stock market may use this as an excuse to correct as it enters a period of elevated risk. While a pull back has been a rare event this year, it should be noted that Drawdowns are fairly common and frequent. In fact, 60% of the time an investor can be expected to be in a state of Drawdown. However, more important from an investor standpoint is whether a potential near-term pull back, if it occurs, can precipitate into a Bear market. At this time, a quick answer appears to be "No." Earnings, Economy and Monetary Policy are instrumental in Bear and Bull market cycles. Presently, all three are aligned towards pro-growth, favoring a bull market. In addition, there appears to be no investor excess that typically precedes a long-term change in trend. 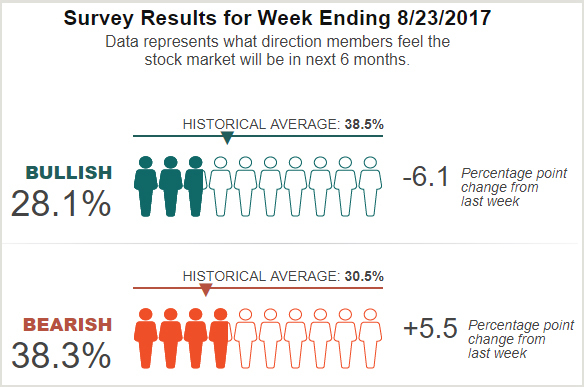 Individual investors, a contrarian indicator, remain a pessimistic group, as evidenced by the Investor Sentiment Survey by AAII. Short of an unanticipated systemic shock, there appears nothing on the horizon for this year to suggest a looming bear market, even though we may be heading for a period of enhanced volatility. Examples of such a systemic shock can be an escalation of hostilities with North Korea towards an imminent war or an incriminating report of the Presidency by special counsel Robert Mueller. 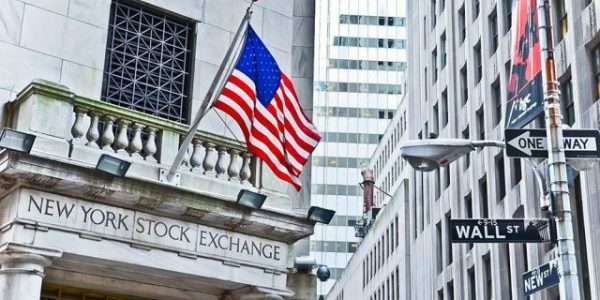 The stock market is heading into a period of elevated risk due to factors relating to the pro-growth policy agenda of the administration and Federal Reserve's monetary policy, which can potentially lead to enhanced volatility over the next two months. This does not mean that investors should shift entirely to Cash. But it may be prudent to consider a downward revision of portfolio stock allocation for the near-term. We are presently fully invested in our Graycell Small Cap Portfolio, which was up +26% at the beginning of August, and in our Prudent Biotech Portfolio, which was up +14%. But we may consider recalibrating our stock exposure to align with our viewpoint for the immediate months ahead. The article was submitted on August 29, 2017, on Seeking Alpha and can be read here.